I have always associated the word Sanguine with one of the four humors as theorized by the Alchemists. Pondering the term the other day I had a thought that the word must also have a related meaning to blood, since in Spanish the word for blood is sangre. Sure enough, upon exploration, I discovered that the etymology of the word stems from the Middle English 1275–1325 "Sanguyne" meaning a blood-red cloth. I also found a reference to Heraldry, a reddish-purple tincture. At the mention of "tincture" I became curious and that took me down an entirely different rabbit hole that has to do with the colors of Coats of Arms. 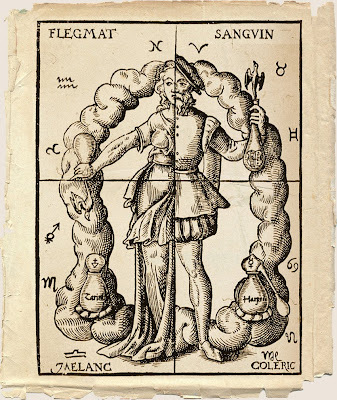 Getting back to Sanguine, Hippocrates furthered the idea of humors by developing a theory on human beings as each having a temperament or humor which was relevant to each element and/or season. Galen, Steiner and Eysenck evolved the theory and added new perspectives. The Spring temperament is referred to as Sanguine. Those born with a soul imprint of the celestial sphere of Spring tend to be painted by nature with vibrant tonalities and have a temperament which is social, vibrant and friendly. When the Greek physicians evolved the idea of the humors theory they attributed human moods, emotions and behaviors with by bodily fluids. The Sanguine personality was thought to have a predominance of blood and thus a ruddy complexion. The Latin word for blood being sanguis hence leading us back to Sanguine. Olfactory wise, fresh blood contains a metallic note due to the high levels of iron. Metallic notes in the fine art of botanical perfume are those containing camphorous and phenolic components, often found in the leather fragrance family. Some leather notes are Birch, Cade, Calamus, Cassia, Costus Root, Davana, Mastic, Myrtle, Spikenard, Styrax Tarragon and Opoponax. I have a leather accord/chord which has three other accords/chords contained within it. Nothing like a little complexity. Other references to blood in the natural perfume palette are the delicious euphoric blood orange essential oil and pure dragons blood latex. I utilized fresh, liquid, dragons blood resin, Croton lechleri, from a fast growing Ecuadorian tree in the newly released Phoenix Myster. Here is a link to a Tropical Plant Database with a reference to Sangre de Drago as a substance with kills cancer cells! A very Happy All Hallows to you!